In one of the most significant events in V8 Supercar history Japanese car giant Nissan will join the pinnacle of Australian motorsport and touring car racing by entering the Championship from 2013. After a 20-year absence from the Australian Touring Car Championship, Nissan Motorsport (Australia) will run four cars with up and coming V8 Supercar team Kelly Racing. 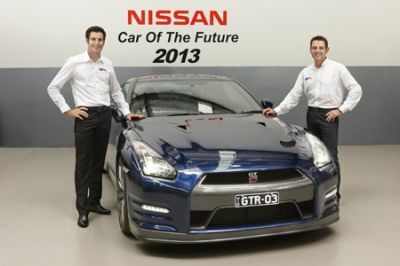 From 2013, Kelly Racing will campaign as Nissan Motorsport – a formalised factory team. The announcement was made in Melbourne today by Nissan Australia Managing Director and CEO Dan Thompson; Ian Moreillon, Executive General Manager, Sales and Fleet, Nissan Australia; V8 Supercar Chairman Tony Cochrane, and; V8 Supercar CEO David Malone. They were joined by V8 Supercar Commission Chairman Mark Skaife; Kelly Racing Chairman John Crennan, and; Kelly Racing co-owner-drivers Todd and Rick Kelly. Nissan is the first manufacturer to take advantage of the Car of the Future program which virtually two years ago to the day was unveiled with an aim to cutting running costs and encouraging other marques to compete, in turn broadening fan and sponsor appeal. Nissan’s decision confirms that the Car of the Future program is high on the agenda of V8 Supercar teams and potential new manufacturers. V8 Supercars expects more manufacturers to follow Nissan’s lead given the high profile of the sport domestically and internationally. The sport intends to grow to 18 events world-wide (up from the present 15Championship events) across 40 weeks in the coming years. The first Car of the Future prototypes were unveiled at the Sydney Telstra 500 just last December. Nissan’s entry into the V8 Supercar Championship reflects its brand promises of “innovation and excitement”: innovation with the Car of the Future program, and excitement through the attraction and popularity of V8 Supercars. It also believes the sport will add significant momentum to its primary and corporate brand profile in Australia. Nissan is highly acclaimed and successful in global motorsport, its products having won the European-based FIAGT1 Drivers’ Championship, Japanese SuperGT Championship and the LMP2 class (1st and 2nd) at Le Mans last year. Managing Director and CEO of Nissan Australia Dan Thompson said: “We plan to use our presence in the series to strengthen our passenger car credentials in Australia. “Nissan believes that, alongside Ford and Holden, we possess the most convincing motorsport DNA and track history in Australia, making a V8 Supercars debut in 2013 an obvious initiative. V8 Supercar Chairman Tony Cochrane, who announced the Car of the Future program in March 2010, said it confirmed the global demand for V8 Supercars by manufacturers and destinations was very real.“We welcome Nissan with more than open arms,” Mr Cochrane said. “This announcement confirms all we have known about V8 Supercars for a long, long time – that we are truly an international player, an extraordinarily popular sport amongst fans globally and in great demand by big business and corporate players. Kelly Racing will from 2013 be a fully-fledged Nissan factory team developing its own cars and engines, utilising the global resources of the giant NISMO motorsport organisation. Rick Kelly, a V8 Supercar champion and multiple Bathurst winner, was enthused about the move. “I couldn’t be more excited with the opportunity Nissan has offered Todd, myself and the entire team at Kelly Racing to become their official factory team,” said Rick Kelly. “Nissan’s genuine enthusiasm, unwavering support and absolute professionalism through this evaluation has been tremendous and underpins their absolute intentions of Championship success in the category – a dream we share and hope to deliver on. “This new partnership has only been made possible by the endless amount of hard work that John Crennan has done for Kelly Racing on this project, and that of Ian Moreillon, Jeff Fisher and the team at Nissan of which Todd and I are very grateful. “The Nissan Car of the Future (COTF) project is a huge undertaking however Todd and I are firmly focused on the job at hand this season ensuring that Kelly Racing takes those important steps forward on and off the race track. “Development of our cars and recruitment of key personnel in the off-season should assist us to realise these immediate goals. Business partner and elder brother Todd Kelly said Kelly Racing’s innovative business strategies fitted perfectly with Nissan’s desire to enter the V8 Supercar Championship. “Rick and I have had one clear goal that we have been striving for since we started Kelly Racing, that was to become a benchmark race-winning team with factory support,” said Todd Kelly. “The timing with Car of the Future has enabled us to engage a manufacturer and achieve that. We couldn’t be happier to be a factory Nissan team and Factory Nissan drivers. Car of the Future architect Mark Skaife said the ground-breaking announcement was only the start. “This opens up a whole new chapter for V8 Supercars,” Mr Skaife said. “The sport and the brand have been so successful over such a long period of time with today’s news reinforcing the direction of the business, coupled with imminent international expansion to multiple destinations globally. “Nissan has clearly acknowledged V8 Supercars as a major component of their future plans within the Australian car market and motorsport internationally. V8 Supercars will deliver on their expectations. The three-year Car of the Future project, led by Mr Skaife and a key team of engineers, designers, car builders, V8 Supercar team personnel and drivers, is complete with 2013-spec Holden Commodore and Ford Falcon fully tested and on the showroom floor. The cars, developed with the sponsorship support of Dunlop, represent the next generation V8 Supercars, paving the way for new marques. V8 Supercar teams have already commenced building their new cars before the compulsory roll-out in 2013.